Many thanks to Natalie Kilgore, she created this artwork just for the ATL LOVE series. Welcome to the ATL LOVE Series! I've asked a handful of my favorite Atlanta bloggers to give us an-eats-and-treats tour of their favorite Atlanta area neighborhood over the next few weeks. 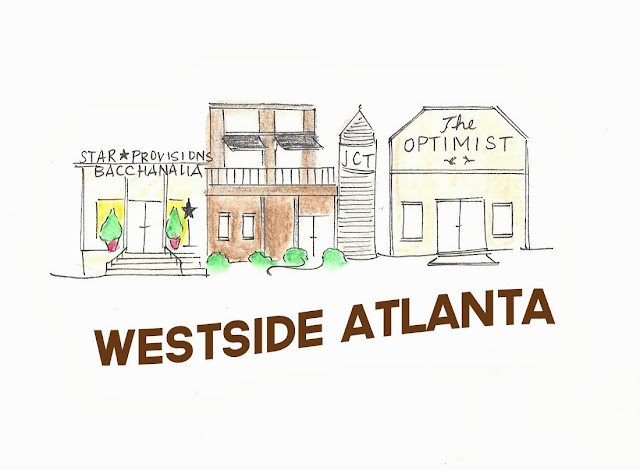 Today we tour Atlanta's Westside (which is sometimes called West Midtown). The Westside is one of my favorite neighborhoods and I'm so happy to have one of my favorite Atlanta food bloggers - Erika Council of Southern Soufflé - show off her work-hood. Erika is a working mama, who also just moved houses, and yet still some how manages to churn out amazing recipes every week. Her Gin and Ginger cocktail is one of my new favorites. PS Erika has a quick wit and a fabulous eye for photography - you'll love her blog. Find more of Erika at Southern Soufflé or stalk her on Twitter, like I do. What you love about your hood: My hood caters to the foodie in me. Some of Atlanta's best restaurants live on this side of town. From the Optimist to Atlanta's best soul food at K & K. With Star Provisions, which is like the Anthropologie of the food world, topping my list of what I love the most. It's a marketplace, a bistro, a bakery and beyond. Best meeting friends for drinks: JCT Kitchen, Ormsby's, Northside Tavern for some hole in the wall dive bar greatness. Many thanks to the talented Natalie Kilgore, who's incredible hand drawn illustrations "really tie the series together". You can purchase her work in her etsy shop, Natty Michelle Paperie or follow her blog, Natty Michelle, for her insightful "free-lance ladies" series or peeks into her charming home. Love all of her picks; they are spot on! I especially love the recommendation for JCT...that's our wedding venue!